Ted Cruz, Republican candidates upset at CNBC moderators for asking reasonable questions. 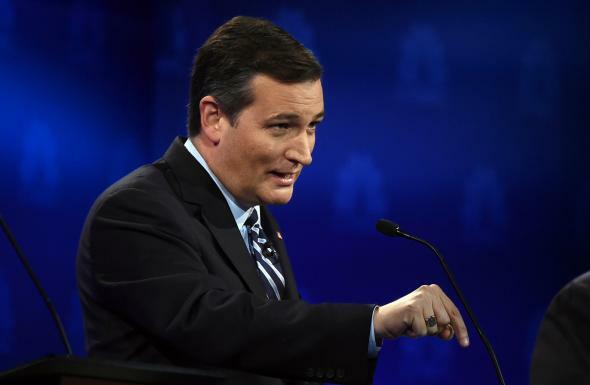 Ted Cruz gestures during the GOP debate on Oct. 28, 2015, in Boulder, Colorado. Wednesday night’s Republican presidential debate is on CNBC, whose business-minded moderators have asked questions to Donald Trump, Ben Carson, and Ted Cruz challenging the wisdom of their approaches to the federal budget. Trump and Carson have proposed massive tax cuts that nonpartisan and even conservative analysts have said would raise the deficit by trillions of dollars; Cruz has famously pushed the U.S. to the brink of defaulting on its debt, which almost everyone—including the leaders of his own Republican Party—agrees would be a catastrophe. CNBC also asked Marco Rubio a pointed question about his frequent, well-documented absences from the Senate, asked Carly Fiorina about her widely criticized performance as CEO of Hewlett-Packard, and pressed Jeb Bush on his campaign’s poor poll numbers. Let me say something at the outset. The questions asked in this debate illustrate why the American people don’t trust the media. This is not a cage match. Donald Trump, are you a comic book villain? Marco Rubio, why don’t you resign? Jeb Bush, why have your numbers fallen? How about talking about the substantive issues—contrast with the democratic debate, where every thought and question from the media was, which of you is more handsome and why? Let me be clear. The men and women on this stage have more ideas, more experience, more common sense, than every participant in the Democratic debate. … The questions being asked shouldn’t be trying to get people to tear into each other. The American people apparently agree with Ted Cruz that asking rational questions about not driving the economy into a ditch is quite rude!